Truly fascinating. Keefe did an awesome amount of research, and organized the overlapping stories on different continents so that the pacing was right on this multi-decade tsunami of immigrants from China. Epic in scope and mouth-dropping in detail, these interlocked stories touch so many lives and so many parts of the world, it must have been difficult to know where to begin. The characterizations are rich, however, and Keefe gives us a human-scaled drama. What struck me at the end was how persons of every ethnicity, political stripe, and religious persuasion could find justification in these stories for holding a particular view about immmigration. Let it also be said that people who usually react one way on immigration turned 180 degrees when it came to a boatload of Fujian refugees dumped on Rockaway beach in a storm. Political arch enemies joined hands to save these folks, most of whom undoubtedly had absolutely no clue why anyone was trying to help them. Law-sy, I'd like to see a film made of this. Great reporting. This book was interesting. I did not expect that it would be. I learned things I didn't know about Arab culture--hearing from Osama's first wife, Najwa, and Najwa's fourth son, Omar, gave two distinct points of view into an Arab household. More to the point, perhaps, we see into Osama bin Laden's household. At first I was perplexed that a son, an Arab son no less, would discuss internal family affairs so publicly. 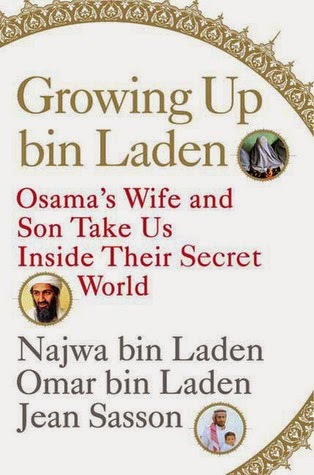 The more I read, however, the more I understood that Osama bin Laden sacrificed his privacy with his acts of war, and even his family members felt alienated from his peculiar view of the world. His son tells us that he hated his enemies more than he loved his family. It saddens us, for then destruction is his only goal. Osama has given up his life for...not his family, not his country, not his countrymen, but to ruin his enemies. Is there anything more impoverished than that sad fact? When Osama married the first time, he was a wealthy young man with a bright future. His wife moved to Saudi Arabia from Syria to live in relative comfort with Osama and his extended family in Jeddah. By the end of the story told here, his wife was living in a cave in Afghanistan, suffering untold deprivations. Osama began as a serious young man who sought to raise the approbation Islam received in the world. But he was exceptionally humorless in his approach to life. He expected such seriousness from his growing family of sons that he would not allow them to smile enough to reveal their teeth. "...my father actually counted the exposed teeth, reprimanding his sons on the number their merriment revealed." This is a fascinating memoir of unusual candor which deserves to be read widely. I had access to a hard copy of this book as I listened to Rory read it on CD. I am completely in awe of his heroic walk through the mountains from Herat to Kabul in war-torn Afghanistan after the fall of the Taliban government in 2002. I learned more from his journey than from many other things I have read about Afghanistan, excepting perhaps Didier Lefèvre's book The Photographer, which is a excellent visual accompaniment to this volume. Stewart managed to distill the thousands of interactions he experienced on his month-long walk into revealing vignettes that amuse, instruct, terrify, and sadden us. That he developed a deep and abiding respect for Afghanistan and it's people is obvious and infectious. I was pleased to learn of his return to Kabul, and of his role as Executive Director the Turquoise Mountain Foundation of Kabul. I'd give much to be there with him. An NPR story in June 2010 gives us some information on the movements and present thoughts of Rory Stewart. Katz is so capable--of involving himself in so many things & keeping so many balls in the air--that one wishes he would take on something bigger. But one can hardly say that creating a baseball league and safe place for young people in a marginal town near a dangerous city is not an important thing in these times. Katz is passionate, and inspires a passionate response in the people with whom he has contact. His writing is good enough to keep one skimming the passages even when one has begun to question his choices. That may be the reason for his success: though we might not make the same choices as he does, we are willing to hear him out and allow him to lead--he is better than most, honest at least, and not a bad sort, at heart. 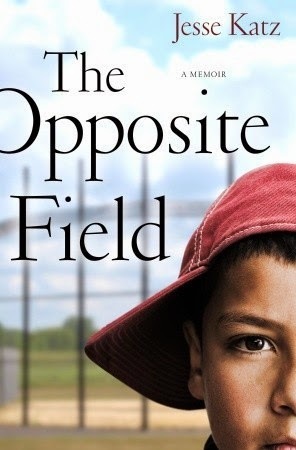 It was bittersweet to discover what the title, The Opposite Field, meant when I got an explanation, finally, in the Epilogue. Katz didn't appear to hold anything back in telling us of his life, his thoughts, his feelings. At times I wondered if indeed, he was telling us a little too much. Sometimes his choices did not seem fully considered, but whose are, in the moment. It is only with hindsight that we can say what we perhaps should have done with that opportunity. I suppose there wouldn't be much of a memoir if he didn't tell it all--after all, he didn't run a country, a state, or even a city. He was a father trying to grow a boy. In the process he grew up himself, along with a boy to be proud of, a solvent and hugely successful Little League, and a community. A world away from my life and very valuable to me for that. 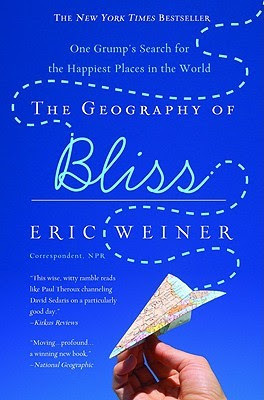 The subtitle of this book is One Man's Search for the Happiest Places in the World, and I am going to cut to the chase and discuss his conclusions. You're going to want to read the book anyway, to figure out how it can be true that a very unlikely country comes in first in the happiness lottery. But do get the audio of this book. The author reads it, and as an NPR commentator, talking is his trade. He is very good at it, and is as funny as David Sedaris in parts of this reading. "Happiness is one hundred percent relational," is the conclusion of the author, who quotes Karma Ura, Bhutanese scholar and cancer survivor. We can only be happy with other people, because happiness does not exist in a vacuum. We knew this, but we need to be reminded, perhaps. And there may be basic ingredients that compose happiness, but the final composition will vary around the globe. The author compares happiness to the atom carbon: arrange it one way and it is coal. Arrange it another, and it is a diamond.